The Salvage Corps demolishing a British Army rest camp. 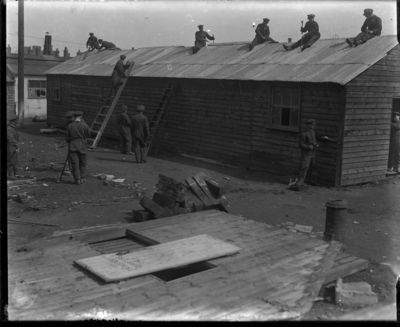 Glass plate negative showing soldiers of the Salvage Corps demolishing a British Army Rest Camp near the London and North Western Hotel in North Wall, Dublin. For more information see an article titled "The Salvage Corps" in An tÃ“glÃ¡ch, Volume 6, No 1 (New Series) 5th May 1923, pages 3 - 6.